Here is the new official roleplay topic for WCZ as the old one went kaputt. Side characters could now be used just to add some more entertainment or whatever. No need for character apps. Just start rping. But it is required that you post more than 5 Sentences. Gore and such are acceptable. 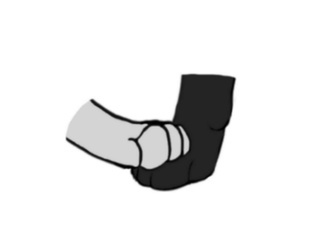 Keep in mind, this is an official rp of our characters, whatever happens here, affects your character elsewhere. It was the middle of Leafbare. The land of the Clans was chilled to the core, prey was scarce, quarrels between Warriors often erupted, and nothing seemed to be getting better. Snow continuously fell, temperatures dropped, and disease sprung up in each territory. But what kind of disease? Well, Green-cough and White-cough were two of them, though there was something else...It was an unknown sickness. Its symptoms began similarly to White-cough, then into Green-cough, except something was off. With each passing day, the symptoms grew worse, Medicine cats tried using all of their already low resources, but to no avail. Cats began dying left and right, many succumbing to the disease and to despair. Leaders tried reassuring their Warriors that "Everything will be all right"...Everything was the exact opposite of "all right." RiverClan. Everything was near peaceful. Well, despite all of the frantic Warriors worrying that they were "next"...It was mouse-brained. All of it. Sure there was an unexplainable epidemic going around, but Cherrystar was sure it would clear up eventually. All that nonsense the other Clans were spouting about "Undead Warriors" was ridiculous. There was no such...thing...Alright, maybe there was. But not the way those bird-brained cats thought. 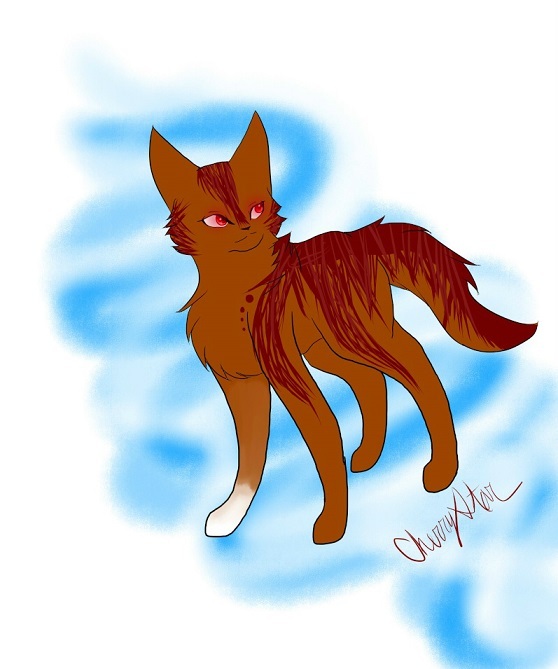 The only "Undead Warriors" Cherry knew were StarClan and The Dark Forest. Wait, perhaps that was it then. Perhaps The Dark Forest was finally going to attack the Clans! There hadnt been any recent omens about it though...Then again, not everything could be predicted by StarClan. Well, whatever. For now, Cherrystar had to make sure no more Warriors of hers died. She hoped Iceshard continued to serve her for many more seasons to come, along with her most trusted Warriors and her apprentice. Location : In the forest. Ivyfrost stepped out of her warm den into the cold camp. She padded over to the fresh-kill pile,and picked out a mouse,then strode back to the front of her den and put it down. Before taking a few grateful bites,the she-cat sent a silent prayer to StarClan for the prey. After she ate it,she checked the herb stock,and found out that she was running low on catmint. Ivyfrost acknowledged it,then padded out of camp to find some more. ~The last two sentences weren't intentional,but I had to put five sentences. So here we are. Stormstar padded out of his den and immediately fluffed up his fur against the cold. A mist and strange aura hung around the camp which was the last thing he needed. There was fear amongst the Clans, an incurable disease ravaging his own and worst of all: seemingly vanishing cats. Stormstar had heard time and time again these rumors about "Strange cats" around the burial sites. As much as he wanted to pass these off as dreams from StarClan or otherwise that would mean something worse. Whatever was going on he knew it meant trouble, something was coming, he just didn't know what. 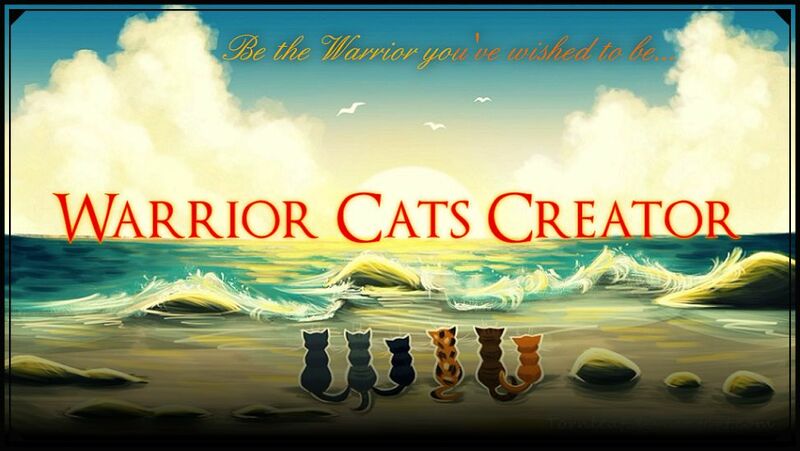 ~We should make a Warrior Cats Amino Group. Should we not? ~I'm sorry to say but we could not. Well, not an official one at least. There are already way too many groups. Cherrystar glanced around her surroundings, but she couldn't help but sigh. Things were looking glum here with the clans, and living in these territories gave nothing but fear to each warrior. Food even became scarce, the sun continuously hid behind clouds, the river turned murky, and their land was frozen over with snow. But these signs could mean anything. She did not have the slightest belief that her warriors were living again after having died. Warriors from other clans mentioned such things at their previous gathering, though their claims lacked evidence. How would that have been possible anyway? She supposed they were hallucinating, or they had seen the spirits of their ancestors, StarClan and theDark Forest. Whichever it was, Cherry would not be convinced until she had seen it herself. Stormstar padded across the camp to the medicine den. He entered as the smell of sickness flooded his senses, Cinderwood sat above one of the ill staying in her den. "That would be no then." Stormstar meowed. "I've tried everything I know, the cures for whitecough, greencough, blackcough and even deadcough." Cinderwood meowed, "I don't think I can do anything else." Stormstar placed his tail on his friend's shoulder, "You are the best medicine cat I've ever seen, you treated illnesses we'd never heard of back in SeaClan." "But then I had Whitepaw." Cinderwood meowed, Stormstar remembered the small white tom, from the moment he was allowed out of the nursery he'd hang around the medicine den back when Cinderwood was an apprentice. "We all miss our friends from SeaClan, but now, we need to focus our thoughts here." Stormstar meowed, he understood the medicine cat's sadness, for him he missed the cat he would always spar with, the cat he thought of as his brother, Windslash. 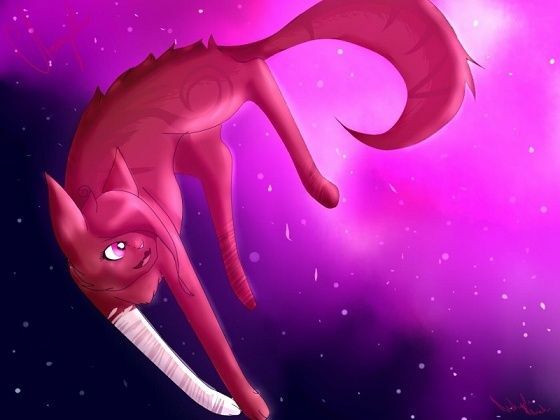 "I haven't seen them among the ranks of StarClan you know, that means they could still be alive." Cinderwood meowed, the sadness in her eyes was immediately replaced with determination, "But you're right, we need to focus on the here and now." "Let me know if there's anything I can do to help." Stormstar meowed, he turned and began to leave the den. "Stormstar!" She called back, Stormstar paused and looked over his shoulder, "Thank you." "I'm glad I could help." He purred, he turned and continued out of the den. Windstripe had just been sitting around and watching as her clanmates died around her. She couldn't stand to watch her clan, the clan that raised her after her mother was killed, die without reason! Finally, Windstripe had had enough of this disease. "I have to see if my friends are alright," she whispered to nobody. Windstripe silently slipped out of camp. Since she was the youngest warrior it easy for her and she had done it before. She stopped just outside camp, took a breath, and ran. Cloverspots sighed as she picked up another leaf-bare frosted bramble and placed it securely over a gap on the "barren" nursery wall. As much as she thrived in protecting her clan mates, young and old, she found it an extreme pain to be stuck in camp all day just guarding the camp due to the scare of strange looking cats wandering all over the territories. Though, she couldn't blame them for doing so. She herself was scared to just leave the camp by herself to explore and hunt for food for her clan. There was no way cats could be lying about such a serious topic, especially if a cat from every clan was saying so. Still, her heart ached to just leave the clan without the fear of being "next". Windstripe ran and ran until she came to the border. "This is where Riverclan is," she huffed. Then, she thought a moment. "Or is this where Shadowclan is?" she was now confusing herself. "Ugh!" Windstripe threw her head back in frustration. "I don't have time for this! I need to see if my friends are ok!" she growled. Now she thought about it, she was also worried about her family outside the clans. She was even worried about her dad. Though he did kill her mother, he was still her family. So Windstripe made up her mind and crossed the river border. Stormysky was woke by an on sudden screaming she charged out of her den and barreled into the warrior's den. Only to find that Nightshado was missing. Windstripe climbed out of the river and onto what Riverclan territory. But before she went into the camp, she started to have second thoughts. "Oh, I can't bother Cherrystar right now," Windstripe said as she turned away from the camp. "She probably has enough trouble on her paws with this dreadful illness," Windstripe padded away from the camp entrance and out into the woods. "I hope my family is ok," she said to herself as she started to run again. She new she had to help her step-siblings and she guessed her step-mother. But Windstripe didn't know about her father. She looked at the scar on her stomach and winced a little. She didn't get to think about her father long because she heard a sound. And it was close. Windstripe stopped running and froze in place. She didn't know if it was a clan cat or one of the "zombie cats". Windstripe wanted to run, but she was to afraid to move. Stormysky turned around and yowlled into the darkness. Featherstar walked to her and licked her ear in sympathy. The warrior that had gone missing was her dautor Nightshado. Stormysky had been sent to the medicine den beacous there had been a badger attack on the camp and that's when Lionblaze had died and she had been badly injured. Then Featherstar realized that it was their kit that had been taken and started to whine. Dawn patrol suddenly raced in yammering about 2 cats ripped to shreds but the odd part was that they were talking. Hope you liked it!!!!!. #whoop whoop!!! Midnight neared the rabbit and pounced killing it with a swift bite to the neck, this was the first prey she'd seen for a while. While it is leaf-fall and prey will automatically be more scarce but here was different, There was even less prey than usual. Midnight wanted to pass this off as simply the Clans stocked up on more prey than usual but she knew that wasn't right. If that wasn't enough she'd been hearing rumors of a mysterious sickness ravaging the Clans so she steered more clear of their borders, even if the rumors of the "mysterious cats" near the burial sites were incorrect, there was still a sickness. A dark shadow is hanging over the Clans Midnight thought to herself. She looked to the sky now growing dark and starry Have you got something planned... StarClan? The air was as stiff as Windstripe frightened. She didn't know what to do. "I should have just gone in to Riverclan camp. I'd rather die at the paws of them then of a 'zombie cat'" Windstripe thought to her self. And if only she weren't so scared she could warn Riverclan about a "zombie cat" coming. She decided just to except her fate of dying right then and there. She waited for the cat to come into view, and was surprised at what she saw. She walked slowly back to Featherstars den and fell asleep. when she woke up Featherstar was standing by her. She walked out and Featherstar called a meeting and told the clan about Nightshado. Then Stormysky started organizing patrols. She left the camp with 3 other warriors. When she returned they had two shrew, a squirrel and a couple birds. She was unusually very exhausted, too exhausted. She decided to go to the medicine den. Inside Jayfeather and Silvertail, the medicine cats were sorting herbs. "Um, hi can you help me " she asked tentatively. Then Silvertail turned around and saw how round Stormysky's belly had grown. "Oh my your expecting kits!!" She squeaked. Any one want a mate? what post on topic please.
" What I'm expecting more, now" she said " yes" silvertail replied. she left to find Featherstar and found him eating. "Featherstar I'm expecting kits , Featherstar they'll be here in a moon. "Their names are wishkit, speckit, stripekit, and nightkit." she told Featherstar. he smiled and snuggled up to her purring. Location : Secretly sneaking in the shadows, to meet Stormshadow..
Silverleopard was waiting behind the ThunderClan camp for her mate, who was going to meet her. Suddenly, she heard a whispering. "I'm so excited!" "Shhhh! Quiet, Stripekit, or Silvertail will catch us!" "Don't be a downer, Wishkit!" Silverleopard cautiously followed the sound and saw three kits! "Mouse dung!" "Wishkit? What are you doing out of camp?" Silverleopard exclaimed, she had heard that Featherstar's mate had 3 kits from the gathering. "It's not my fault! These two wanted to go out, and i couldn't let them go and possibly get eaten by a fox!" "F-Fox?!" whimpered Stripekit. "Kits! There is no fox! Now i'm taking you back to your mother." "Awww..."
"KITS!" the queen exclaimed rushing to their side. Nuzzling her kits, she suddenly straightens and asks "Where did you find them?" Silverleopard couldn't be sure whether the pang in her voice was thankfulness or suspicion. "O-Oh! I was gathering herbs for my Clan.." Silvertail's eyes darkened "Was it for the.. sickness..?" "Huh?" "The sickness," came a voice. The two looked up from their conversation to see Featherstar padding up to them as he continued, "Causes a cat to start rotting from the inside. Blood will seep from their mouth and cause them to choke. It has been spreading throughout the Clans recently, i suggest you should tell your leader, unless he already knows." leopard-like spots, muzzle and orange eyes with amber flecks. "They don't know." she said as she pressed her silver paw against his. "We're safe." He lay down with her and wrapped his long tail around her shoulder. "I know.." "I have something very important to tell you." she whispered in his ear, "Yes..?" She sighed and spoke. "What is that"? Said Featherstar. "A kit, if you recall the warrior code it says that the queens have reaspobalty to all kits nomater the clan." She remarked. Windstripe breathed a sigh of relief. She thanked Starclan when she saw her half-brother. "Tanner, its so good to see you," Windstripe nuzzled up against his neck. Tanner returned her affection, but he looked serious and worried. "Windy, something terrible is happening," he said. "I already know about the illness, Tanner. But right now we need to get you, Sammy, Lily, and Chloe to a safe place," Windstripe said. "What about Dad?" Tanner asked. Windstripe looked back at her scar. "I'm sure he'll find us sooner or later," she sighed "now I need you to go tell them to come here so I can take you back to Windclan." Tanner nodded, not asking his half-sister any questions. She watched as he left and started to think about what she was going to tell the clan leader about this. "Will my family even be welcome in the clan?" Windstripe wondered. After what her father did to her mother, would her half-siblings and step-mom even be let into the camp? » After 3 weeks vacation! » Charcoal ash water useful in garden?? ?